It’s been a while since I got excited by a review, but for Publishers Weekly I make an exception. Published in the UK on the 18th June and appears to be available in the US as well via internet vendors. There is no warmth in the ancient fortress of the Pinnacles, timeless bastion against the dragons. The dragon-rider Hyrkallan is a harsh king with a loathing venom for all who practise alchemy. His consort is the mad queen Jaslyn, who once woke a hatchling dragon because she thought there could be peace between men and dragons without the poison of alchemy, a madness that came to her after Speaker Zafir beheaded her mother. The union between this king and queen once carried the desert realms of the north to war and victory, but there is neither love nor desire nor affection between them. Hyrkallan dreams of glories he will never see returned. Queen Jaslyn thinks of the simple things she cannot have. To be with her sister Lystra. To be with a dragon and fly once more. To be left alone and never be touched. Together and apart Hyrkallan and his queen lay tattered claim to realms now ruled by monsters. They make their home with a thousand souls inside the Moonlit Mountain, above the fire-gutted dragon-wrecked majesty that was once the Silver City. Safe within their fortress they search the endless tunnels for relics of the Silver King, the ancient half-god sorcerer who once tamed dragons. It is said, in whispers, that the old queens of the Silver City were one by one driven mad by the half-god’s Enchanted Palace, whose white stone walls shimmer with their own inner light. The last of those queens was Zafir, vanished when the dragons shattered their chains of alchemy. The Black Moon has returned, Zafir is coming home and the dragons are waiting. Will anyone be able to stop them? 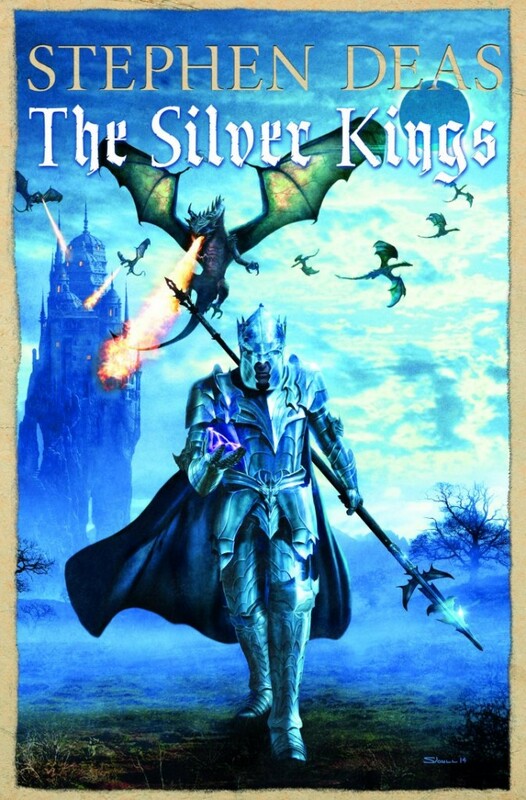 The Silver Kings is a direct sequel to The Splintered God. Read it on its own and it probably doesn’t make a lot of sense. Or maybe it’s utterly wonderful, who knows. But it’s the tenth book in a series and draws on all of what has gone before, soI’d be surprised if it works well on its own. Excerpt: in which Zafir returns to the world in which she was born. Be honest: you’re not going to read this unless you’ve ready some of the rest, not the last volume of a series like this. And I’ll be honest too – nor should you. It won’t make a great deal of sense. So reviews are unexpected and largely by the by – at this point you’re either in or your out. But I’ll post them up as and when i stumble across them anyway.